In August 1982, Johnny Marr and Steven Patrick Morrissey went into Manchester’s Decibelle Studios to record the first two songs they’d written together, “The Hand that Rocks the Cradle” and “Suffer Little Children,” both of which would appear on The Smiths’ debut two years later. 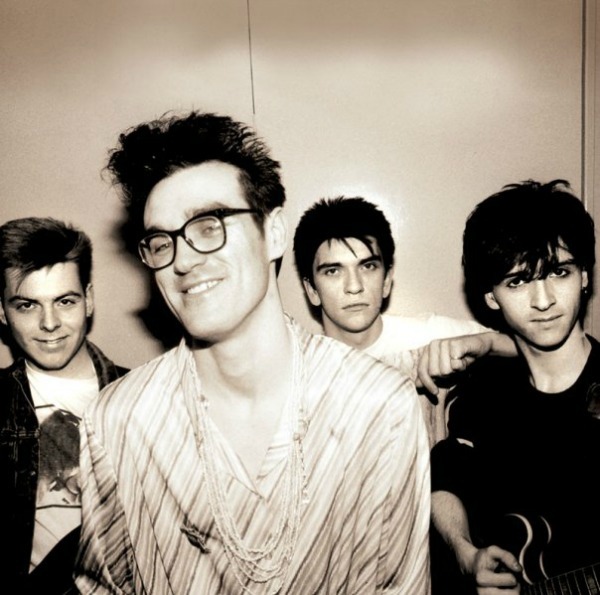 They were aided by Dale Hibbert, a recording engineer who worked at Decibelle — often misspelled as Decibel — and briefly played bass in The Smiths, including on the “Hand that Rocks the Cradle” recorded that day (though not on “Suffer Little Children,” according to Simon Goddard’s definitive “Songs That Saved Your Life: The Art of The Smiths 1982-87”). The drummer on the session was Simon Wolstencroft. After a few teases, Hibbert on New Year’s Eve uploaded the full, spindly 6-minute, 30-second demo of “The Hand that Rocks the Cradle” — which you can hear below — and has since added Marr’s isolated guitar track and backing vocals, as well as Morrissey’s isolated vocals from that song. ‘The Hand That Rocks The Cradle’ featured a grumbling low Morrissey vocal, typical of the group’s formative recordings, while Marr soaked his sketchy, central riff in a shallow flange-pedal wash. Surprisingly, the surviving demo also reveals Marr’s shaky attempt at a backing vocal harmony. … At seven minutes plus, the Decibel ‘Suffer Little Children’ is a much longer prototype than that which was finally to appear on 1984’s The Smiths. Though Wolstencroft’s pattering rhythm was discernibly different from that later applied by Mike Joyce, Marr’s basic melody was intact, if less pithy. So too was Morrissey’s stirring baritone, utilising wraithlike reverb for added drama (the only lyrical difference being the surplus lament from Myra Hindley’s conscience, ‘oh, what have you done?’). The mock Hindley voiceover was also more explicit, cackling haughtily and audibly crying out the victims’ Christian names: ‘Lesley! Edward! John!’. Below, you can hear the full “Hand that Rocks the Cradle,” as well as other parts uploaded by Hibbert. UPDATE: The full “Suffer Little Children” demo is now added below, along with some isolated tracks.